– The playing time for each match is 2 x 15 minutes. – Every team will play minimum of 5 games. – Mini Boys & Mini Girls play on a mini size court (4 players + a goalkeeper). – The oldest category (boys and girls 98/99) will play inside the Kuristiku Gymnasium in the sport’s hall this year. Playing time is 2 x 15 min, break 3 min. All games start and end with one signal. Teams can not use any time-outs. If a game ends with an even score, the winner will be cleared up with 7-metres throws. – Each team has to choose 5 players. Each player has one throw. Teams will make their throws alternately. Teams do not have to assign the order of players. Goalkeepers can be chosen also from field players and one player can be both a thrower and a goalkeeper. – All the players who have not been disqualified from the games (either for 2 minutes or until the end of the game; rule 4:1, IV) can participate in the 7 m throws. – If the score remains even after each team has made 5 throws, the next throws will be made in a different order. Teams will again assign 5 players, all of them can be also the same as in the last round. – Teams will continue assigning 5 players until a winner will be cleared up. Winner will be declared immediately when one team has more goals than the another one (when they have had even amount of throws). ● Win 2 points, draw 1 point, loss 0 points. 5) the result of draw. If according to previously mentioned points one team will be announced to be the first team, the following places will be given by following the same criterion. Referees have to report about disqualified players to the team representative and the head referee. In the MINI category girls can play in boys teams, but not vice versa. All the artificial turf shoes and football shoes are forbidden. 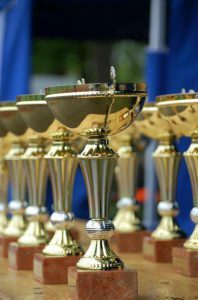 The winner of each category receives a trophy as a team prize. Teams ranked 1st, 2nd and 3rd will be given medals. There will be given maximum of 15 medals for the team members who have registrated officially on tournament registration page in the first playing day. The MINI teams will be given maximum of 10 medals.